UPDATED for 2017-2018: It is necessary for dog owners to provide shelter for their pet to keep them healthy and happy. 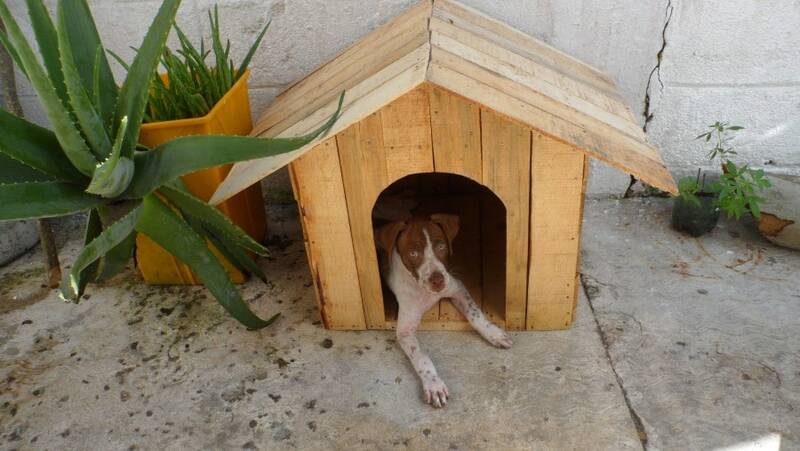 Dog houses are ideal for providing a secure and safe space for dogs to relax and escape the threats of other animals and weather. 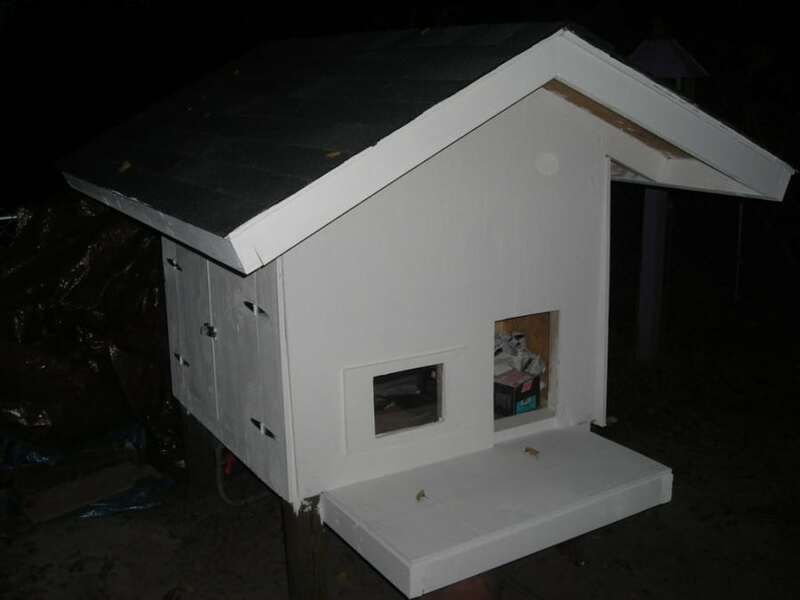 Though there are several ready-made dog houses available online and at pet stores, building your own DIY dog house is cheaper and quite a rewarding experience. 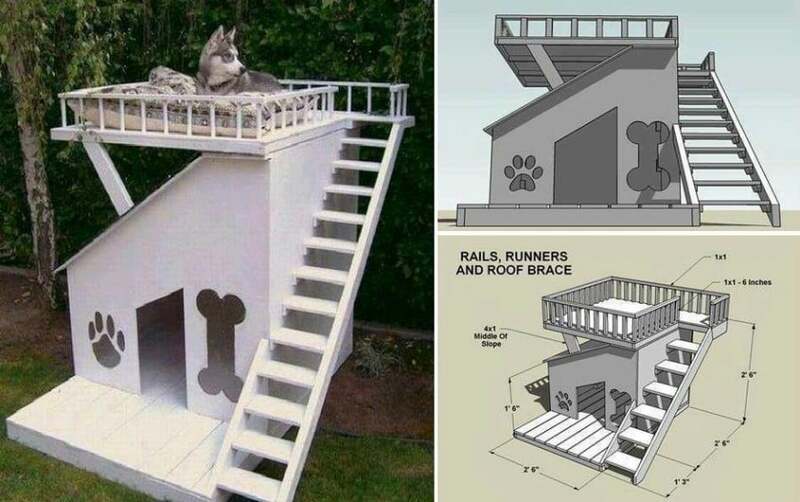 Another benefit of this is that you can design your own dog house according to the size of your dog as well as your own particular taste. There is a broad range of materials, patterns and detail choices ranging from basic to fancy that you can use. 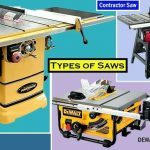 If you are great with tools and have time, here are a few awesome ideas and important tips when building your DIY dog house. 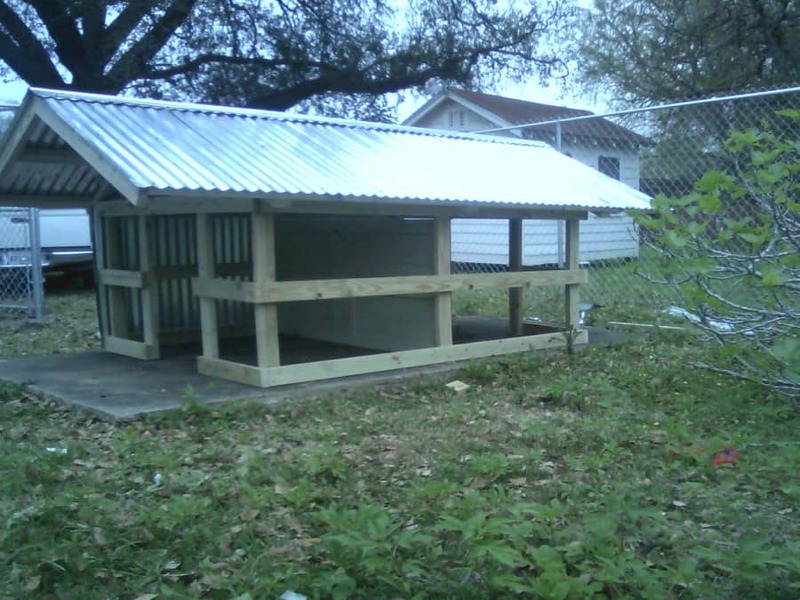 The basic use for a dog house is to keep dogs from getting cold or wet. When building a dog house, make sure everything is set up effectively to make it weather tight. It is important to build an appropriate base that is well above the ground to protect the dog from the wet and cold ground. Use roof shingles and roof felt on the top of the house to prevent rain water from leaking. 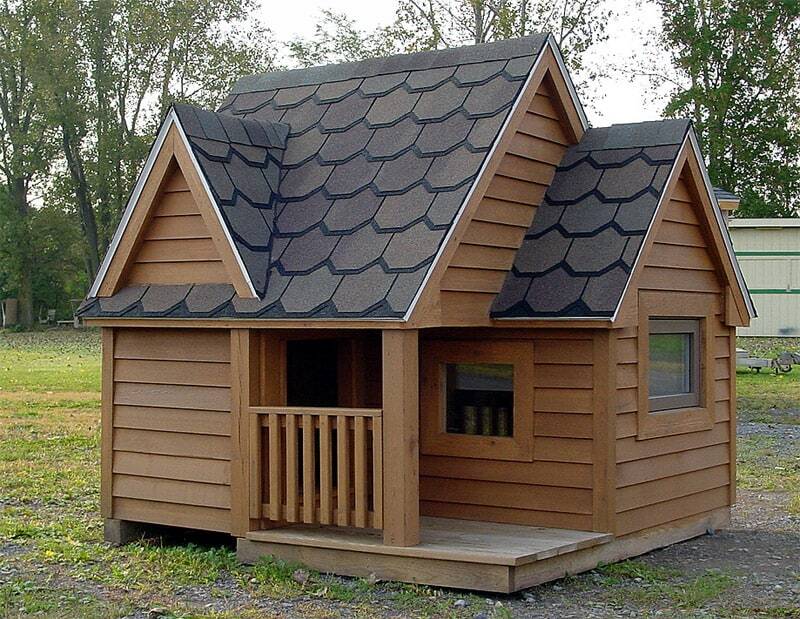 It is advisable to place shingles on the front, sides and back of the house to ensure it is weather tight. 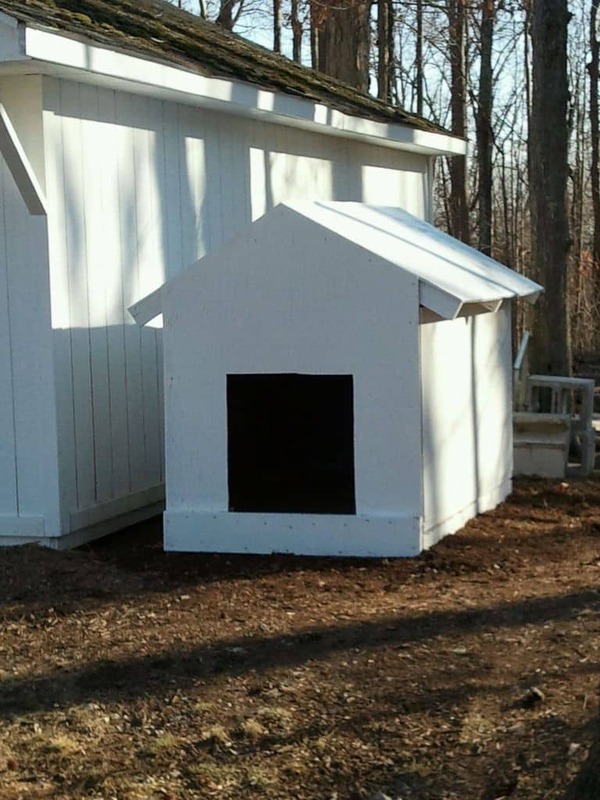 The great thing about building a dog house by yourself is that you can completely customize it according to the size of your dog as well as your personal taste. However, when doing this, there are a few things that you should know. First, make sure you paint the wood or treat it with linseed oil to prevent the dog from biting and chewing the wood. 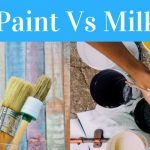 Secondly, when shopping for paint, buy a non-toxic paint for safety purposes. Have fun and be creative when painting, you can draw bones or flowers or anything you want depending on your artsy. Dogs are part of the family and should be kept safe. After completing the dog house, check if any nails are exposed. Exposed nails can cause harm to your dog. Thoroughly inspect the dog house to ensure everything is in place and no potentially harmful objects are exposed before allowing your dog to explore its new palace. Choose a location that is cool and has enough shade. It is recommended that the doorway for the dog house face east to provide better protection from strong winds and approaching storms. The best material to use is wood. 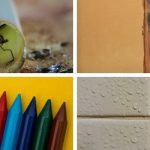 Other materials such as metal and plastic can easily get hot during summer. Remember to drill nickel-sized holes on the sides to provide ventilation. First of all, the construction of the dog house must be energy efficient. For example, having a concrete floor might be good for the summer but it’s not energy efficient in the winter. Prefer a wooden floor compared to concrete. The best way to keep your dog warm in the dog house is to use a heated kennel mat (heating pad). Make sure that the cord of the mat is covered with metal safety coil or maybe you can run the cord inside a PVC conduit to avoid chewing. A cheap way to heat your dog is to put clean straw on the floor with an old blanket or carpet cloth. This depends if it’s an indoor or outdoor house. For indoor dog houses, a fiber-filled duvet or comforter slipped inside a washable cover with some extra soft blanket or old clothes will be great. 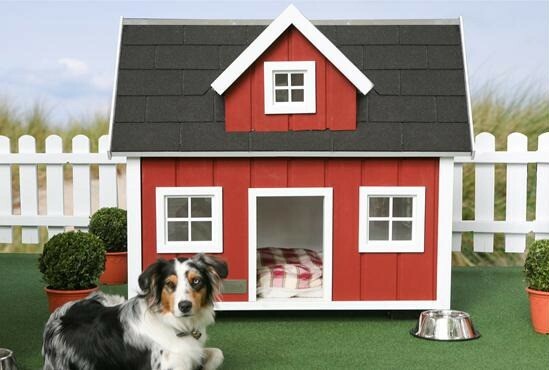 For outdoor dog house, long-stem grass hay or straw are among the best natural type of doghouse bedding. 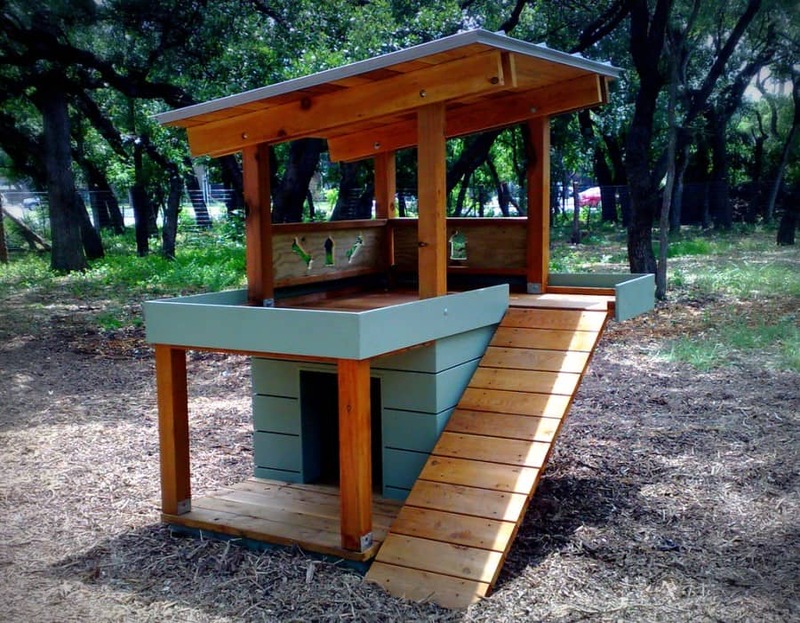 There are several designs to choose from when building your DIY dog house. 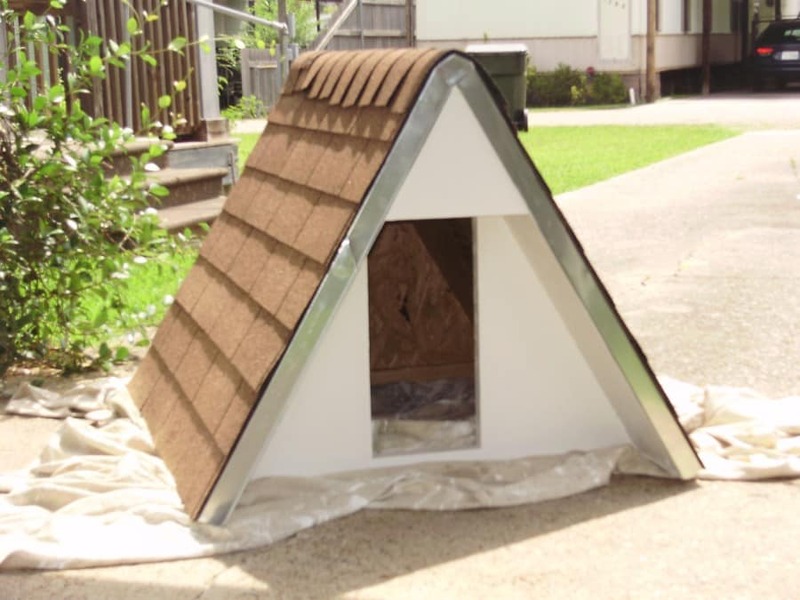 In addition to designs, there are also various accessories that you can add to the dog house, for instance, dog house heater to keep the dog warm or a door flap to prevent snow and wind from getting in. 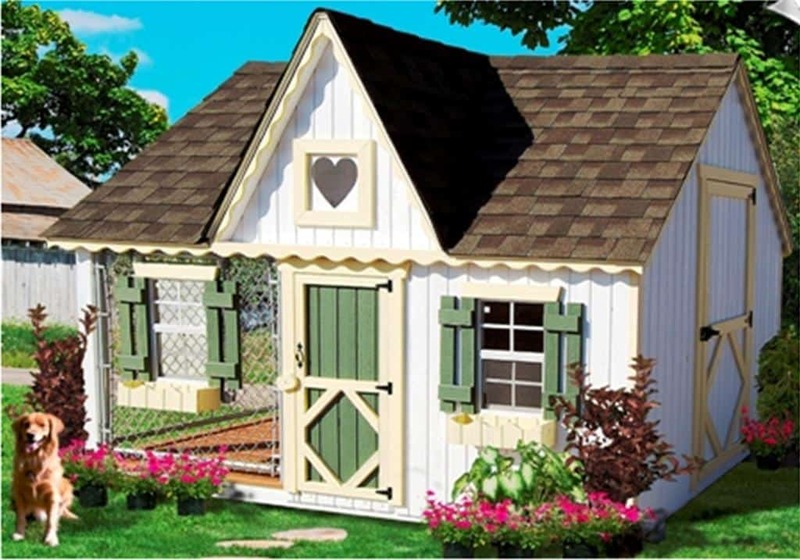 From basic dog houses to dog house mansions, you have a variety of designs to choose from. One important tip when choosing a design is to choose one that complements your yard and house nicely. 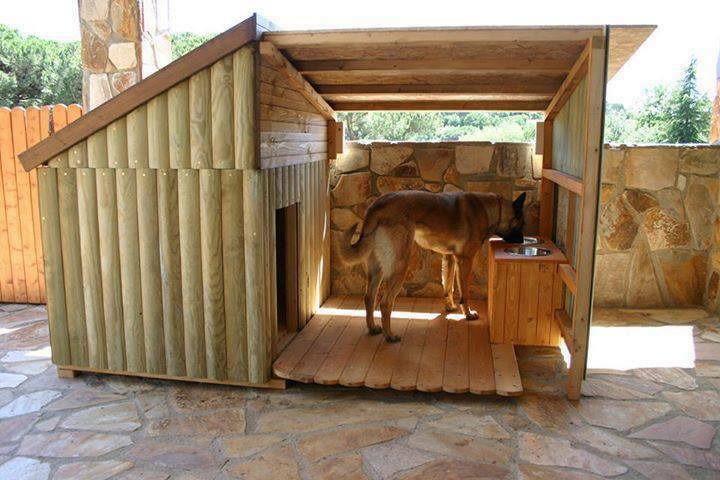 Have a look at the following dog house DIY Ideas to design the perfect safety place for your beloved pet. 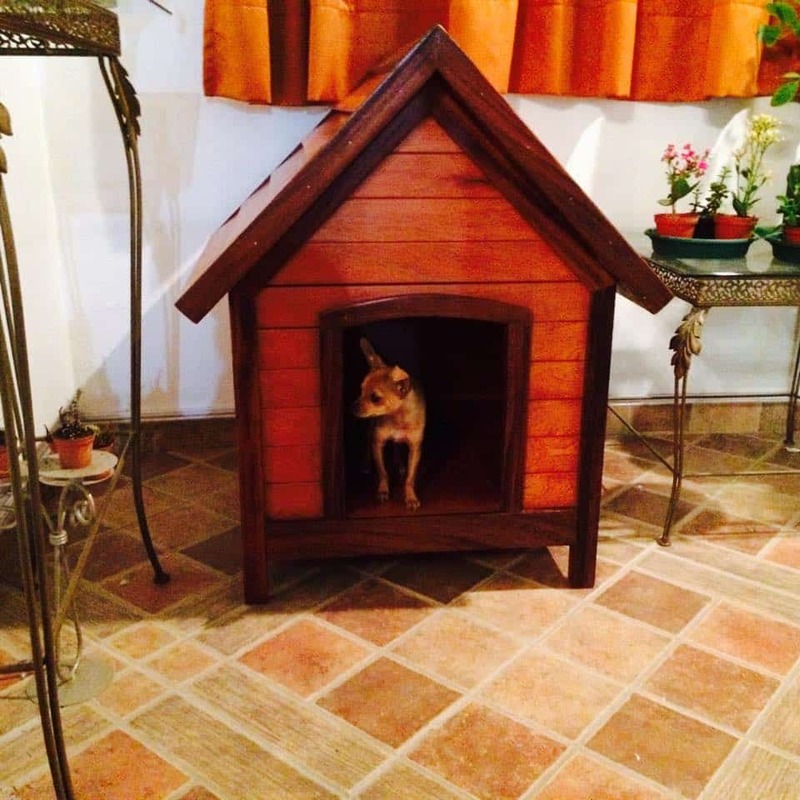 This is a dog house made with White Cedar and Guanacaste trim but any kind of wood can be used as well. Some people commented that they used pallet reclaimed wood. 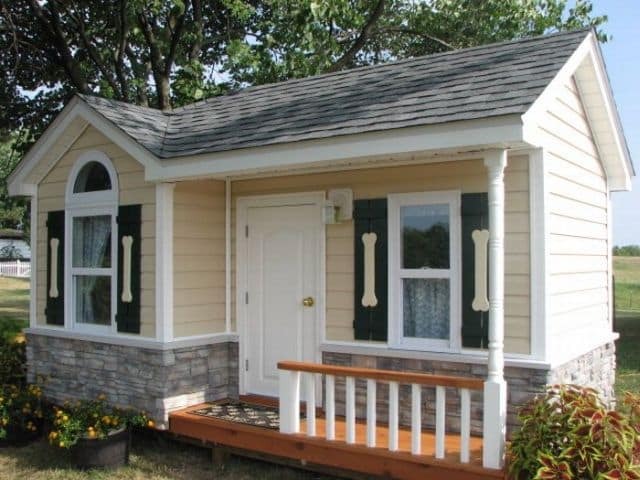 It resembles a cottage style house and will look great in the backyard (make sure to use rot resistant wood though). All boards above are 3/4” thick Cedar. 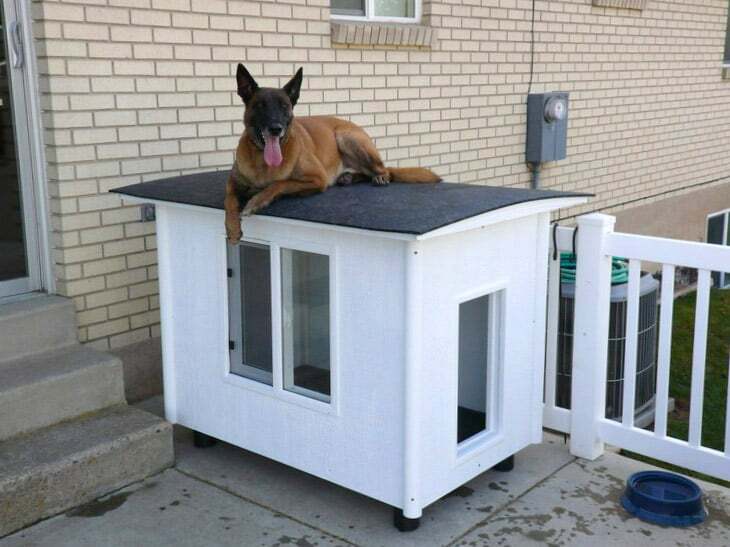 This is a dog house suitable for large breeds like the one shown on the picture above (Belgian Malinois/German Sheppard mix). 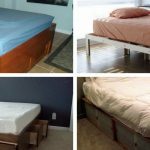 Being a knock-down design you can easily transport it or ship it in case you move away from your home. 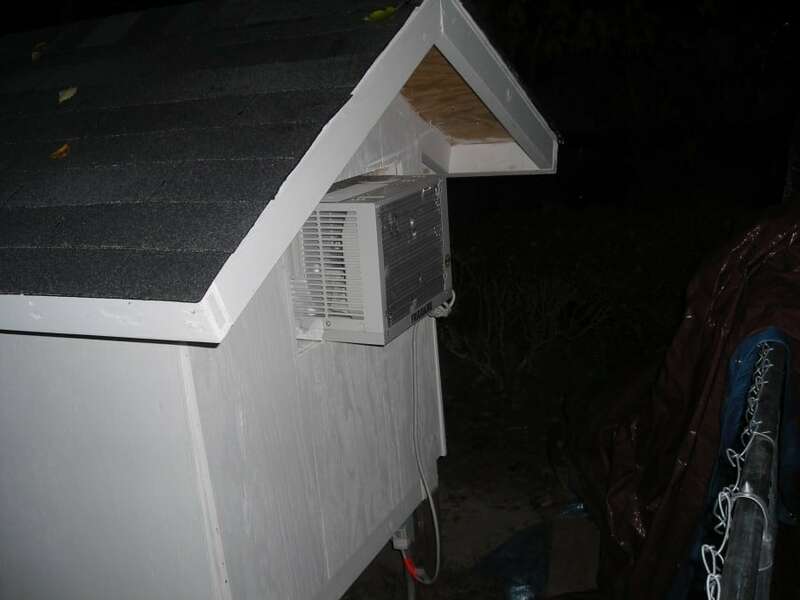 It’s also insulated and due to being high from the ground you can place it outdoors with no fear of water getting in. The whole house cost $375. Built with treated lumber stilt foundation (very good choice to avoid termites), this house is equipped with air-condition, electrical outlet, both large and small access doors and windows etc. 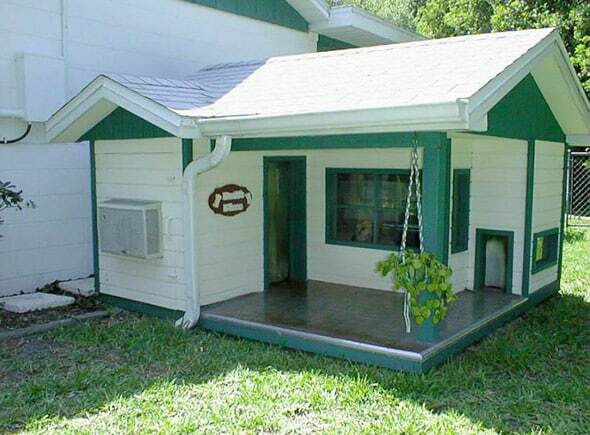 The dog house cost around $300 including the air-condition according to the owner. 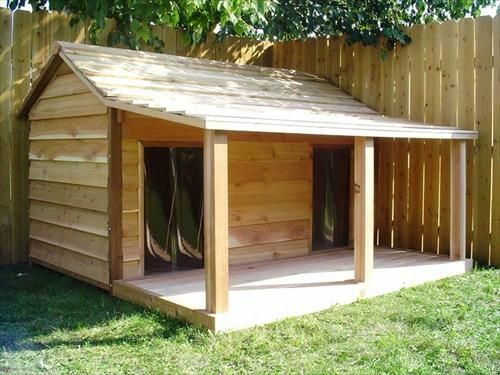 This is a simple dog house for large dogs. 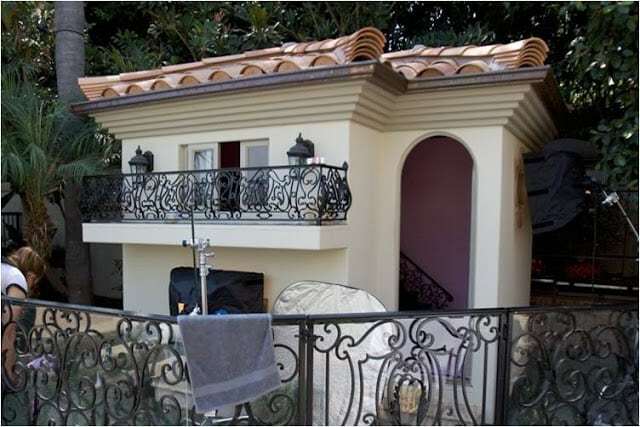 The owner has built this one for a large golden retriever and Siberian husky. 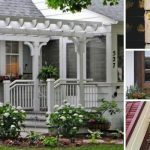 It will look much better if you paint it with nice “earth color” paint or anything to match your exterior backyard area. 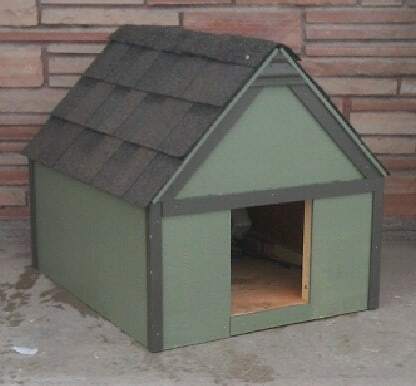 Contrary to the previous large dog house design, this one is suitable for small dogs (such as terrier, cocker spaniel etc) and measures 24”x30”. The house is mainly constructed with plywood and does not cost a lot (around $100). *These can measure 1-3/8″ x 1-3/8″ or 1-1/2″ x 1-1/2″ – My plan will accommodate both sizes. 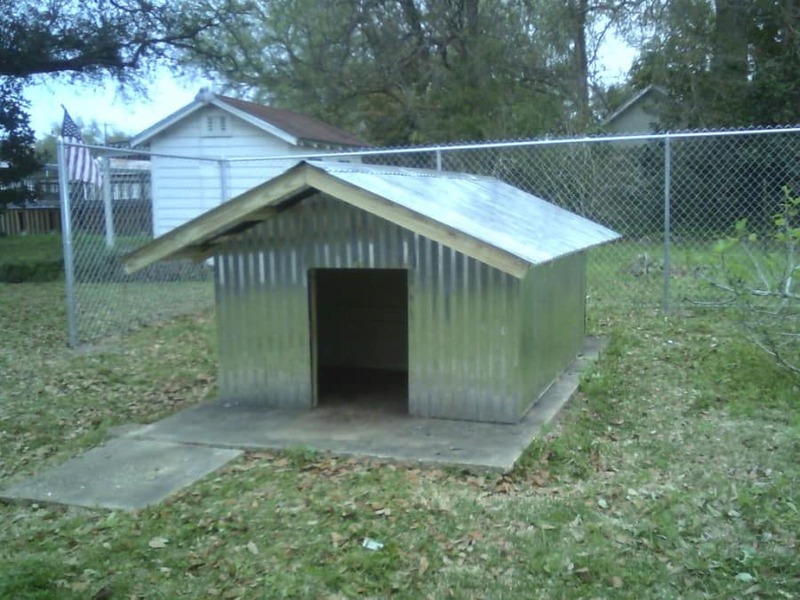 The above will cost around $100 so it turns out to be a cheap dog house design compared to commercial ones. Make sure also to find a dozen shingles as well for the roof. 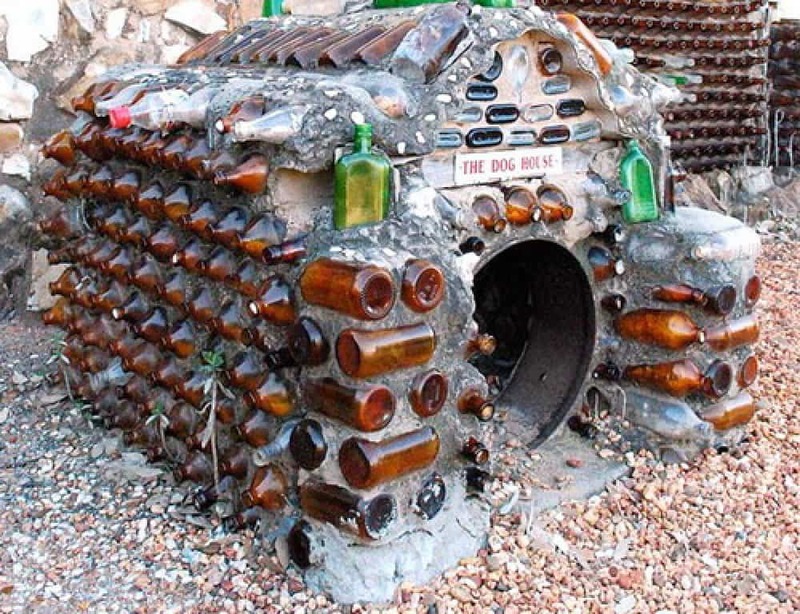 This one uses recycled material such as soda bottles to insulate the roof. 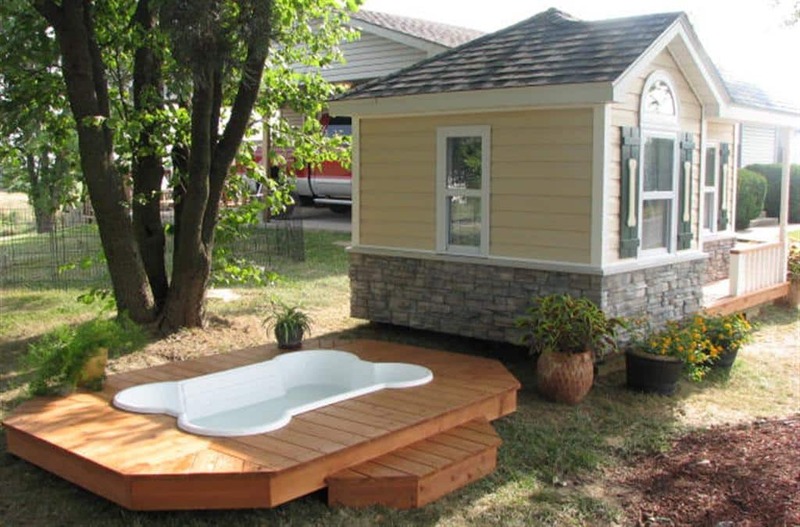 If you have a couple of large dogs then this is an ideal outdoor sturdy design. There is an internal separation so each dog has its own room inside the house. 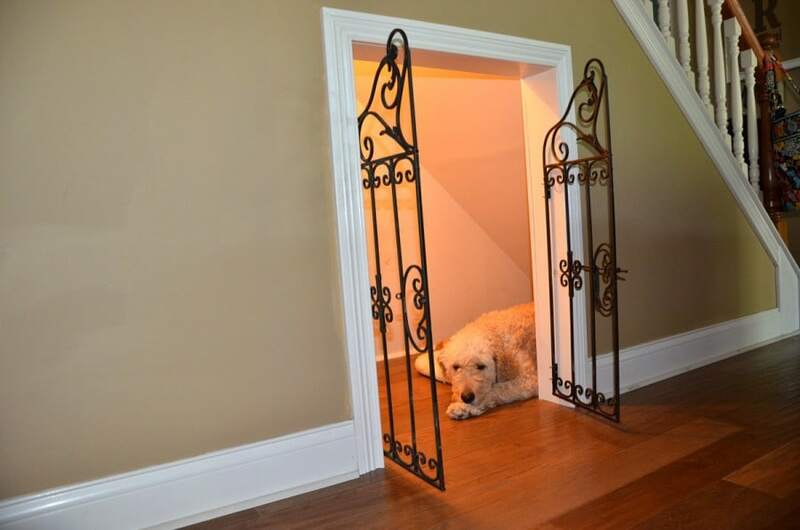 Each dog room measures 4’x6’ and also there are two 2’x3’ doorways for each room. Treated lumber wood (2×4 size) and corrugated tin for the roof makes this house really durable and sturdy. Cost also is under $300. 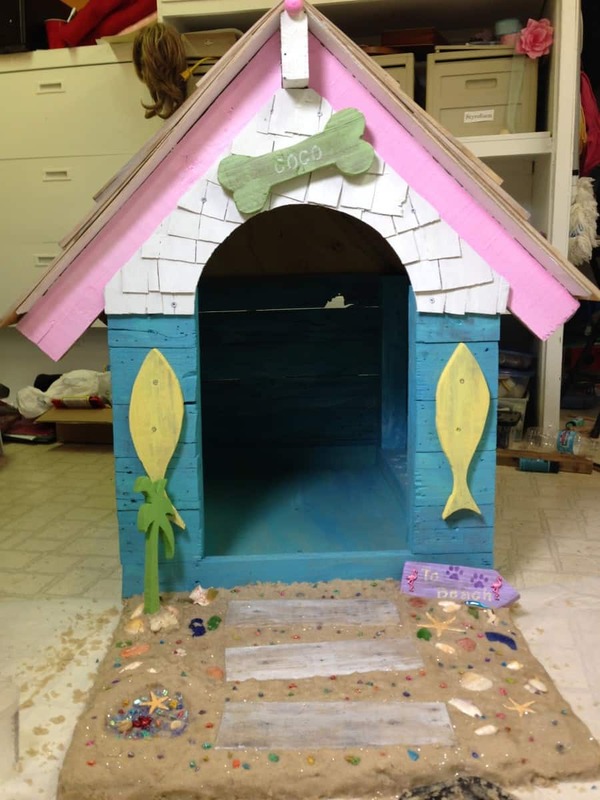 This is a colorful beach style cottage house for your beloved doggy. A lot of repurposed materials were used and the main structure is constructed with an old table, 3 pallets and plywood. The purpose of the dog kennel here is to protect the dog from wind, cold and rain and also to be as durable as possible. Also, walls are insulated and the roof is both sloped and flat in order to allow an area for the dog to relax in the sun. The main construction material used is pallets, but make sure they are not treated with chemicals (some pallets are embedded in chemicals). Also, the frame is built with baton wood. After finishing the construction, the owner painted the whole design with matt black outdoor wood stain paint and the floor with aluminum wood primer. For weather proofing, the roof is covered with roofing felt using a blow torch. Built to be mobile and to house a dog of the size of German Sheppard or large Labrador, this dog house is also sturdy and beautiful. Since the location of the house above will be under a covered carport, there is no need to build a weather proof roof, so take that in mind. 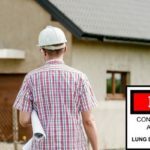 If you are going to place in an uncovered area, you need to use shingles or roofing iron on the top. 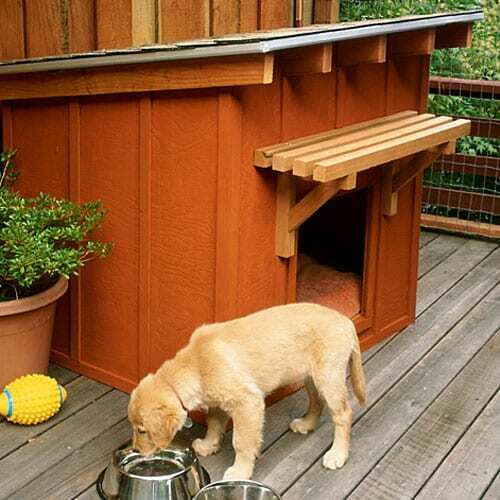 Wooden dog house with covered porch and special food and water cups. 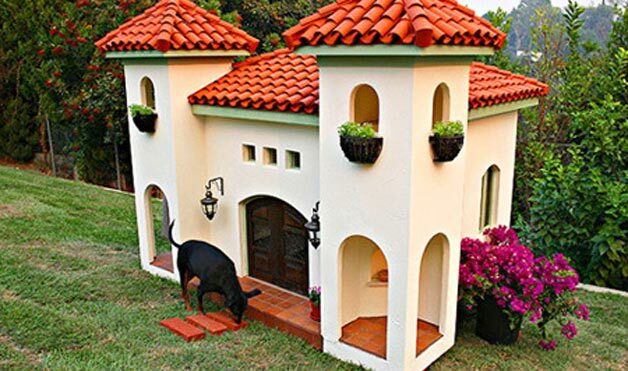 Simple but elegant dog house. I love the color of the wood and also seems sturdy as well. Specifically designed for two extra large dogs with two separate rooms. 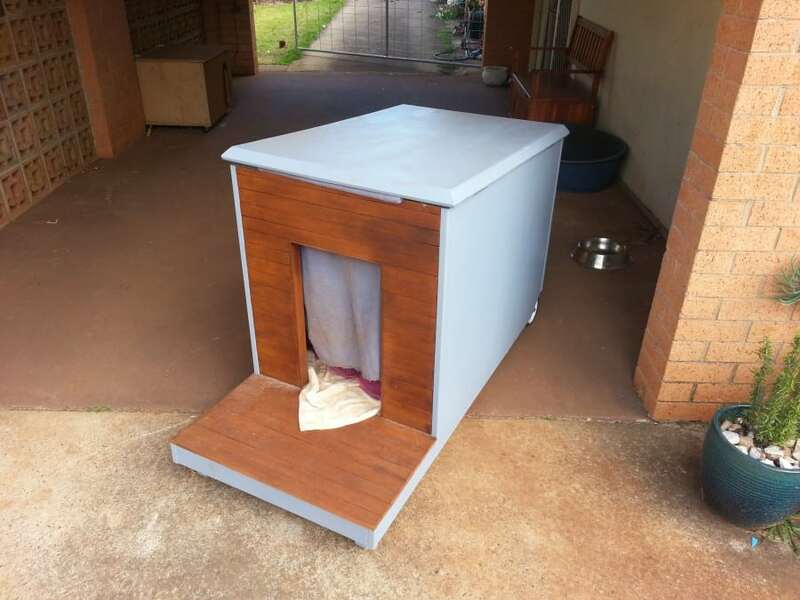 A-style dog house (insulated). 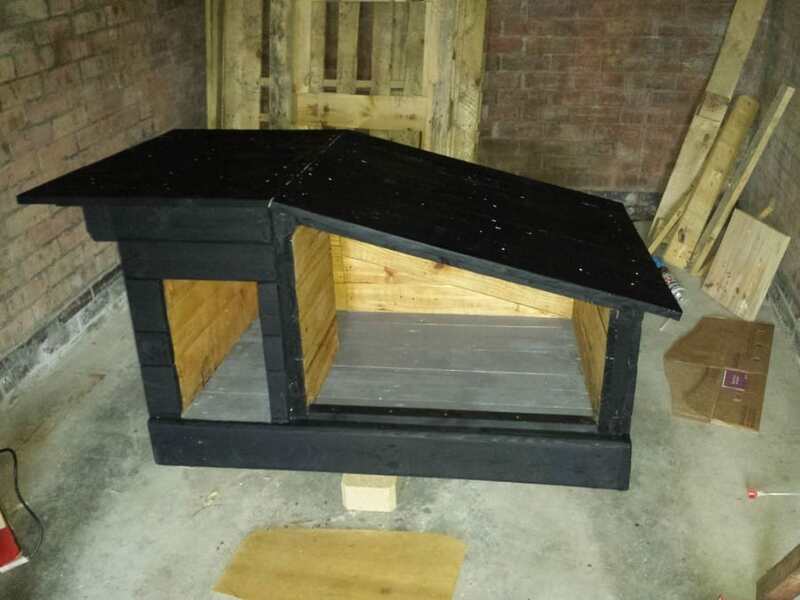 However, it does not include a base so make sure you position this kennel in a suitable place or build a wooden base for it. 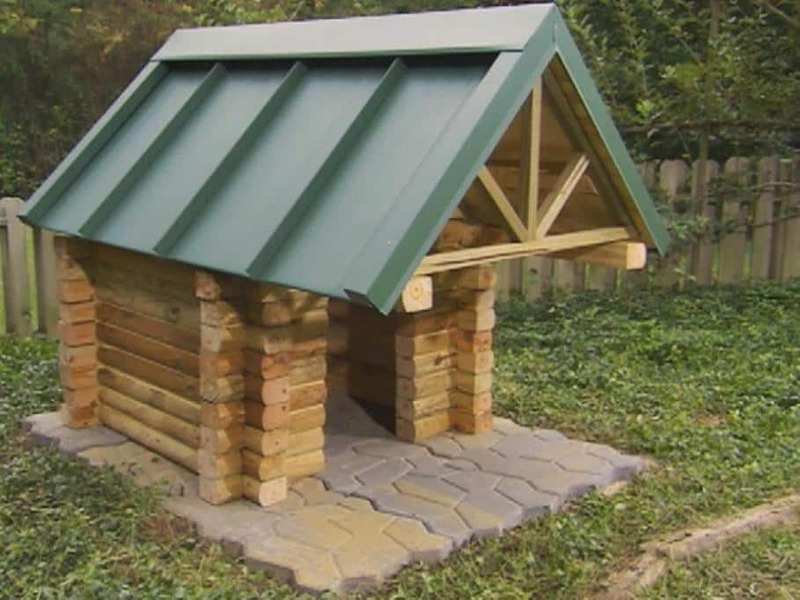 The above dog house from DIY network is made from wooden timber logs and a sturdy roof giving the whole design a nice rustic image. 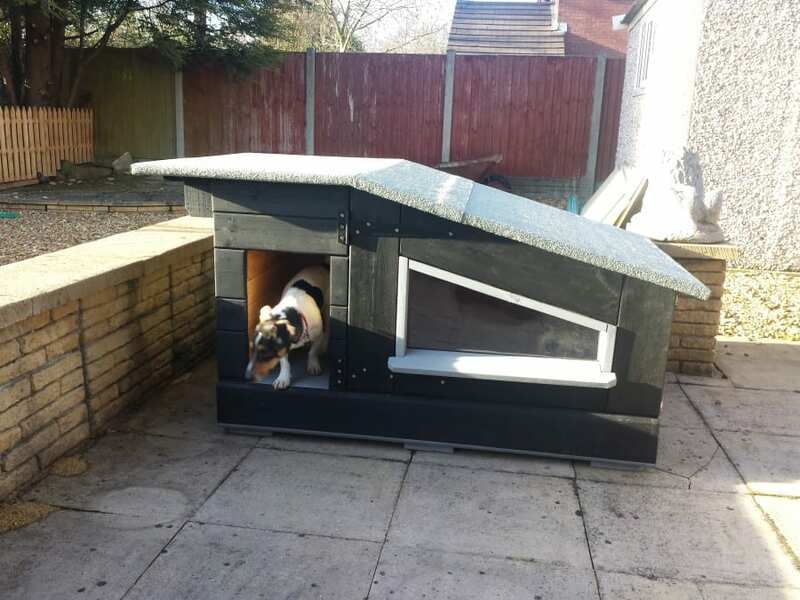 If you live in a sunny town, how about creating a roof top bed for your dog to enjoy the sun? 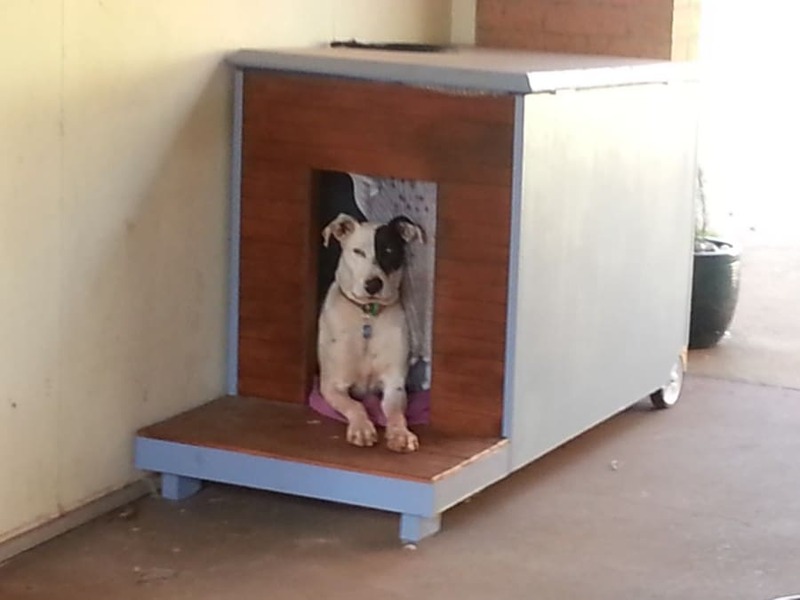 For a total cost of $130, the family above has created a nice dog house under the stairs for a warm and safe shelter for your four-legged “baby”. 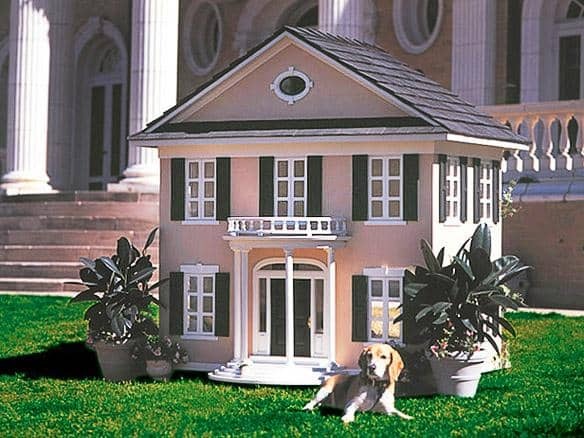 Now let’s see some dog mansions that cost thousands of dollars (for a spoiled dog!!). 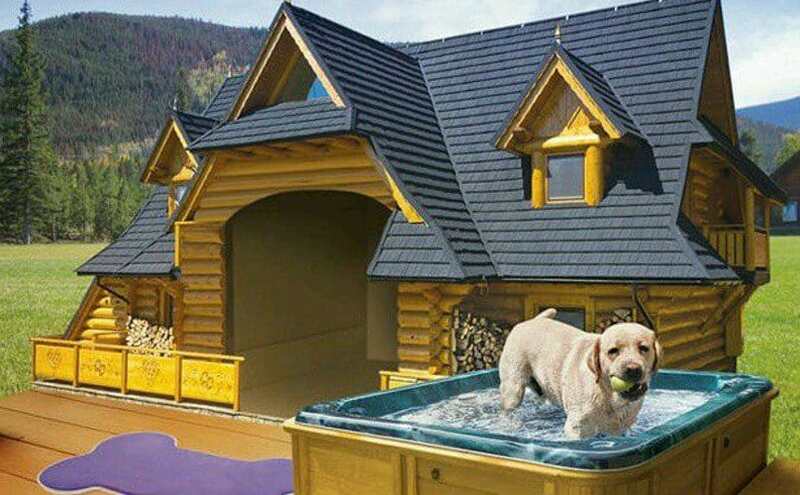 these are adorable and lavish palaces for dogs. But all I can think when I look at these, is “all these dogs want is to be able to sit next to their people. These gorgeous creations look like ways to make owners feel better about not letting their dog live in the house. Dogs don’t care about these things, all they care about is being part of the family (pack) and not being isolated outside and alone in their own heated or air conditioned home. For dogs it’s about relationships. Thanks for your comment. You are absolutely correct about dogs belonging to the family.